Inspirationalists unite. Together we rise. This collaborative project has been brewing in my heart and mind for years, and I’m thrilled to finally share it with you. Born from a desire to lift up the voices of my fellow inspirationalists and to give you the opportunity to learn from some remarkable teachers, The Collective features a growing group of brave intuitive women who have something truly unique and inspiring to share. 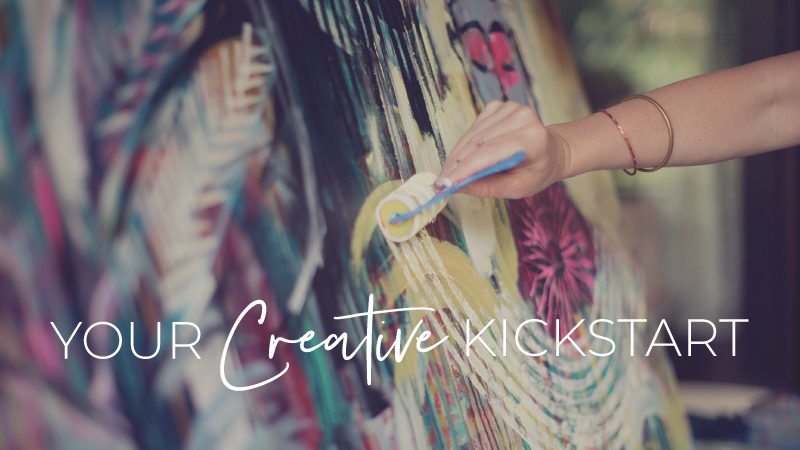 Made in collaboration with me and my team, courses in The Collective feature soulful explorations on topics such as yoga, poetry, nourishment, song, dance, creativity, painting, mixed-media, wellness, and more. Each offering is presented by a savvy expert in the field and available as a complete and affordable online course intended to uplift and inspire. Courses include professional videos, written content, links to resources, and more. Many of the courses also offer a private online community, playlists, audio tracks, and PDFs. All Collective courses include Lifetime Access, so you can enjoy them at your own perfect pace when the time is right. Be sure to join News Art Love to hear about each new offering as it’s available. I believe in the power of community and collaboration, and I also believe deeply in what these women have to share with the world. I know you will love them! Each course in The Collective is presented by a different teacher who is an expert in their field with a unique perspective and approach. Each course includes an introduction video, six instructional videos, plus written content, valuable resources, links, quotes, and any extras the teacher wishes to share with you. Each Collective course is sold separately for $49, including Lifetime Access. You will create an account when you purchase the account, and you will need to be logged into your account to access your Collective content. Your Collective courses will be available to you immediately after purchase. To access your courses, simply enter your username and unique password into the Login Area at the top of this website. Each Collective course is lovingly created in collaboration with the intention of supporting and inspiring you to stay active on your own path — while honoring body, mind and spirit. This course is an exploration of poetry as a healing art. Through encouraging, step-by-step videos featuring exercises and contemplations, Niema lovingly invites you to connect with your Muse by exploring poetry as both a left brain and right brain activity — a powerful blend of freeing your creative voice, while honing your technical poetry writing skills. If you’ve ever wanted to tune into your own creative process through words, learn how to bring more authenticity into your writing, or transform free-form writing into poetry, this course is for you. Taught by international vocal coach and composer/performer, Leslie Helpert, this class is an introduction to Leslie’s lifelong work with the voice as a vital healing tool. In the course, you’ll discover sound warm-ups, singing play, movement practices, awareness techniques, and Leslie’s unique philosophy and artwork. Each element of the course is designed to bring more feeling, awareness, and presence into your vocal experience, either singing or speaking. If you’ve ever wanted to grow and expand the power of your voice, this course is for you. How do I access a Collective course? To access any purchased Collective courses, use your email address and password to Login at the top of the website. Next, select ‘My Account’ from the drop-down menu underneath your name. In your account, you’ll see all your lovely courses waiting for you in the ‘My Online Content’ section. Click on the course you’d like to view, and you’ll go right there! If you lost your password, simply click the “Forgot Password” option to reset. How much does a Collective course cost? Each Collective course is $49. Is there a subscription program for The Collective? At this time, there is no subscription to The Collective. Each course is offered for $49, including Lifetime Access. How often will new courses be available? We do not have a specific schedule for releasing new Collective courses, but are excited to continue to expand the library as new courses come to fruition, likely every other month or so. Is Flora going to be in The Collective? I am involved in the creation of each Collective course from start to finish, but I am not actually in the courses themselves. How long do I have access to The Collective courses I purchase? Once you purchase a course from The Collective, it’s yours to keep! You will just need to login to your account to access all of your purchased courses. The courses are not downloadable, and you will need a strong wifi connection to watch the videos. Do I need any materials to participate? Each course in The Collective is different. Some courses will require materials and others will not. You’ll find this information in the course description. What if I have questions for a Collective teacher? Do I have access to them? Some of The Collective courses will include a private, online community where you can interact with your fellow classmates and the teacher. If an online community is not available, you are welcome to email the teacher directly. Emails will be provided in the course content. Will there be an online community for The Collective? There will not be one singular online community for The Collective, but some courses will include a private, online community. This is up to each teacher. See course descriptions to see what’s included. I’ve never participated in an online learning program before. How does it work? Do I need to be at my computer at a certain time? When you purchase a course form The Collective it’s yours to keep! You are welcome to log in at any time to view the material. You will have access to your courses as long as you are logged into your account. The Collective courses are not downloadable. You will need a strong wifi connection to watch the videos. You are welcome to work through each course at your own pace. Each Collective course will contain a series of six videos which are approximately 10–20 minutes long, in addition to written content. What if I have issues playing back the videos? Confirm that your internet connection is strong and allow the videos to fully load before playing. Check what version of browser and operating system you’re using: http://www.thismachine.info and try to update to the newest version that your hardware can support. Also, some browsers may not support the Vimeo Player (Older versions of Firefox and Internet-Explorer seem to be problematic). We’ve found Chrome and Safari to be the most stable. Full-screen: Click on the four, tiny arrows next to the Vimeo logo to watch the video in full screen. You can use the escape button to return to the post. iPads & tablets: You may need to install the free Vimeo App. Lastly, sometimes a quick restart of your computer can solve many problems. If problems persist, please send us an email at: teamlove@florabowley.com, we’ll get back to you asap. Thanks! What if I have issues with the videos not showing up properly on my phone, tablet or desktop? If you are seeing an issue with the way anything is showing up on your mobile device, desktop or tablet, or if something just doesn’t seem quite right, then please send an email directly to the awesome team at 7/Apps (support@7apps.com). Emails to them should be specifically about the site not about working on your device. But before you reach out to them, please check what version of browser (Click here to find out) and what operating system you’re using (you’ll need to tell them that in your email), and try to update to the newest version that your hardware can support. If that doesn’t resolve the issue, send them a note. Still stuck? Please send us an email at: teamlove@florabowley.com, we’ll get back to you ASAP. Thanks. Do I need a high-speed internet connection to participate? Yes! You will need access to a high-speed internet connection to participate in The Collective. All the videos are streamed and not downloadable. How do I become a part of The Collective? We are starting The Collective by featuring courses from people we know and love. However, we will be looking to add more courses in the future. If you have a course in mind that you think would be a perfect fit for The Collective, you are welcome to send us an email with your idea. All courses are filmed on site in Flora’s Portland, OR studio.